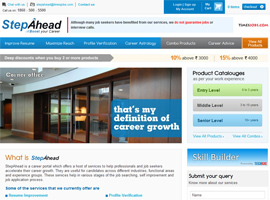 StepAhead is a career portal which offers a host of services to help professionals and job seekers accelerate their career growth. They are useful for candidates across different industries, functional areas and experience groups. These services help in various stages of the job searching, self improvement and job application process. b. Assisted job search and interview preparation services. 3. Profile Verification: With StepAhead’s Profile Verification Service, a candidate can ensure their profile (Education & Employment) is verified. A verified profile wins the recruiters’ trust and gives candidate an edge over others with unverified profiles. In addition to this, verified profile is also highlighted in the recruiter’s search and shows as “Verified by TimesJobs”. This will enhance profile visibility and prompt recruiters to consider the candidate for their current & relevant job openings. 4. Career Astrology: Vedic Astrology based career advice that offers various reports on Career growth, improvement, and other Vedic astrological analysis. Career Astrology helps one understand their capabilities, challenges, and talents and provide remedies to overcome the tough times. It also helps in taking better decisions in one’s CAREER! These Astrology services are NOT generalized zodiac horoscope reports. These personalized reports are prepared by renowned astrologers after detailed analysis of birth and other charts of one’s Vedic horoscope.